Pickle forks and long fingers aside, digging out elusive ingredients from a liquid-filled jar can be a pain in the neck. (Or wrist as the case may be.) Chances are, trying to retrieve the pickle you want only results in a vinegary mess on the countertop. Until they start making pickle jars with strainers for easy access, additional equipment will be needed. Affordable and convenient, the Klip It Round Food-Storage Containers with Bonus Strainers make it easy to store everything from pickles to leftovers. Available in a 23-ounce or a 33-ounce size, the storage containers seal tightly and are made from BPA-free plastic. Freezer, microwave and dishwasher safe. ***Update 5/17/17*** Outdated link above. 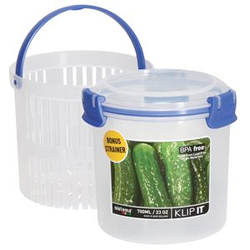 So, here’s a replacement: Lock&Lock Pickle Tray / Pickle Keeper /pickle container (700ml). Poorly rated though, so pickle fingers may be worth it until a good one can be found.